For my family, no Christmas season is complete unless we watch It’s a Wonderful Life at least once. Apparently a bunch of you feel that way about viewing Hocus Pocus during the Halloween season. If so, Freeform has you covered. 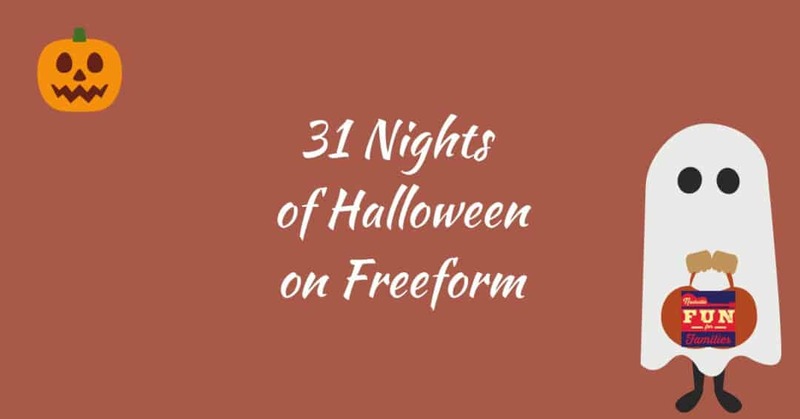 Their 13 Nights of Halloween schedule from last year just got a lot bigger. This year they are presenting 31 Nights of Halloween. Many of the selections look family friendly to me but check the list in advance when making decisions for your own family. Whenever possible, we have linked to the IMDB Parent’s Guide page for each film but remember, the IMDB page refers to the movie in it’s theatrical release. Most of these films have been edited for content and time to show on television. So set your DVR or mark your calendar in advance so your family doesn’t miss their Halloween favorites. 10:25PM Disney•Pixar’s Toy Story of TERROR! 1PM Disney•Pixar’s Toy Story of TERROR! 7:25PM Disney•Pixar’s Toy Story of TERROR! 10AM Disney•Pixar’s Toy Story of TERROR!